Brief Synopsis – Documentary about the life and work of the man who changed the way movie posters were used to promote movies. My Take on it – Earlier this month, my good friend Mutant over at Cinema Parrot Disco posted this review of this documentary and I was completely floored about the fact that I had no clue who Drew Struzan was, but at the same time recognized from my youth so much of his work from his movie posters during the 80’s. After I read her review, I was so fascinated and intrigued by the idea, that I knew I had to watch this movie. It really was interesting to watch and I couldn’t believe the amount of poster art that he created. Many of the posters I actually recall from my youth during the 80’s and never gave much thought as to how they were created and by whom. They managed to get a lot of big name stars to be interviewed and they got to help tell the history and stories of some of Drew’s most famous pieces of movie art; Steven Spielberg, George Lucas, Guillermo del Toro, Harrison Ford and Michael J. Fox all discuss the impact Drew’s art had on their movies and careers. Drew himself seemed to be a laid back painter who fell into the movie industry by accident and helped create such a spectacular array of posters over the years. Learning about his life and the profession itself was interesting to hear about. 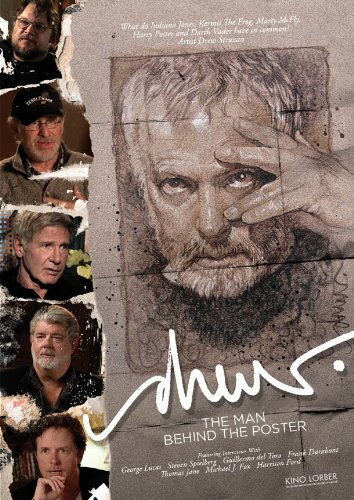 The best part of this movie was being able to see so much of his work that was so iconic in the day, but has unfortunately been replaced by quick Photoshop posters that no longer draw in moviegoers and also don’t invite enthusiasm for said movies like Drew’s work managed to do 30 years ago. Bottom Line – Does an excellent job portraying how movie poster art works and how Struzan’s work in the 80’s help invigorate so much enthusiasm for upcoming movies. It was great to learn about his life and his personal impact on stars and directors. Fascinating documentary that shows some unbelievable movie poster art that Drew created. Highly Recommended! Very nice. I’m interested for sure!